Learn everything there is to know about PRP (Platelet-Rich Plasma) injections! PRP stands for Platelet-Rich Plasma. Platelets are cells that travel through the blood and are routinely used to help repair cell walls and injured tissue. The way the platelets work is by using growth factors within them to promote cell healing. Although there are multiple ways in which we thank PRP works, it appears that the concentration of growth factors obtained by isolating a concentrate of platelets is the most likely mechanism of action. PRP is one of the layer obtained after centrifuging blood that has the highest concnertation of platelets and growth factors. Image showing a vial with PRP and its other components. Once centrifuged, the blood separates into Platelet Poor Plasma, Platelet Rich Plasma and Red Blood Cells. The PRP layer will then be extracted with a syringe for optimal healing. As we section blood using a centrifuge, we are able to effectively spin the blood into different layers. The plasma layer is a water like layer, while the concentrate contains a dense collection of platelets, red blood cells and white blood cells. This concentrate is then used to inject different sites in the body to try to promote natural healing and regenerate tissue. Although we are not able to definitively say how it works, this is our current best understanding of the mechanism in which it works. 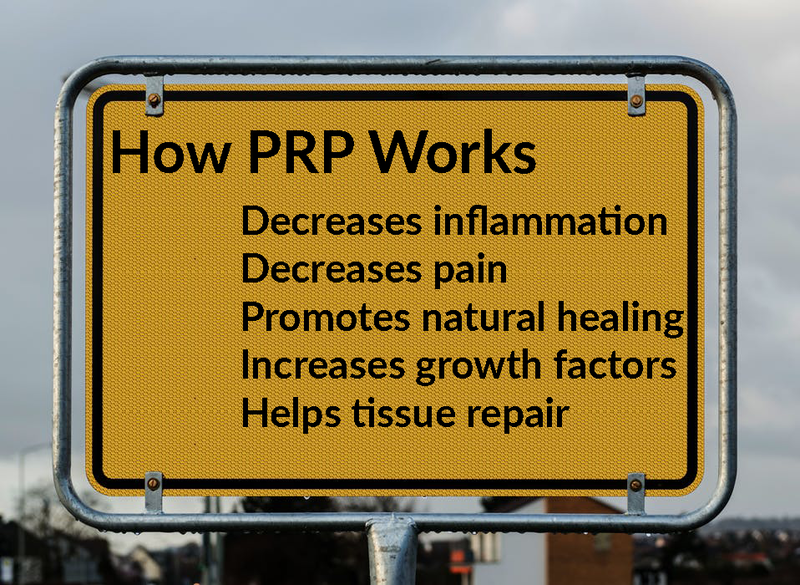 PRP works by decreasing inflammation, promoting natural healing, aiding tissue repair and decreasing pain. Where can I inject PRP? PRP is extremely safe as it is a concentrate of yoru own blood. PRP can be injected almost anywhere into the muscles, tendons, joints and ligaments to promote natural healing. PRP is currently still in studies to see where it serves best, but results have been promising in multiple locations throughout the body! Image showing process of injecting a knee with PRP. The Platelet-Rich Plasma is removed from a vein, then spun down into a concentrate, then injected into a knee joint. Want PRP Injections? Give us some information so we can help serve you best! We will return all responses within 24-48 hours! Yes, Dr. Maurice Jové Yes, Dr. Nathan Jové Yes, Dr. Jeff Traub No, I have not seen one of your physicians.